HomeRanger RickWelcome Back, Scarlet Macaws! 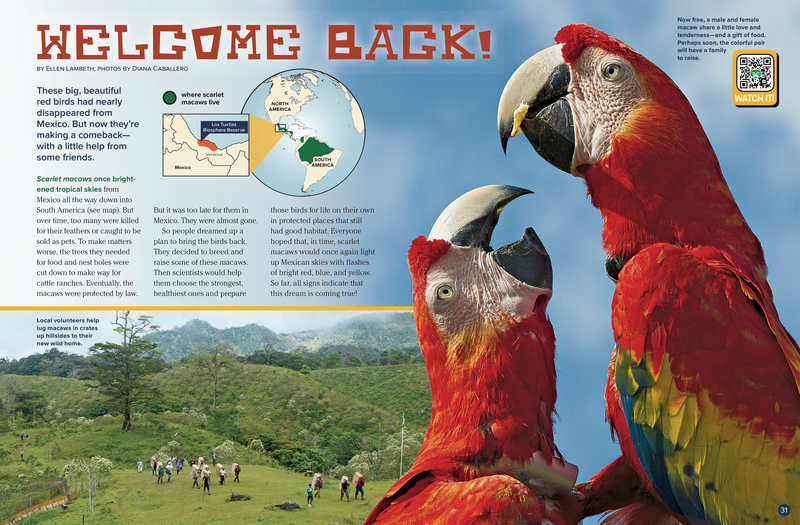 HomeMagazinesRanger RickWelcome Back, Scarlet Macaws! These big, beautiful red birds had nearly disappeared from Mexico. But now they’re making a comeback—with a little help from some friends. Scarlet macaws once brightened tropical skies from Mexico all the way down into South America (see map above). But over time, too many were killed for their feathers or caught to be sold as pets. To make matters worse, the trees they needed for food and nest holes were cut down to make way for cattle ranches. Eventually, the macaws were protected by law. But it was too late for them in Mexico. They were almost gone. So people dreamed up a plan to bring the birds back. They decided to breed and raise some of these macaws. Then scientists would help them choose the strongest, healthiest ones and prepare those birds for life on their own in protected places that still had good habitat. Everyone hoped that, in time, scarlet macaws would once again light up Mexican skies with flashes of bright red, blue, and yellow. So far, all signs indicate that this dream is coming true! WATCH A PAIR OF SCARLET MACAWS! 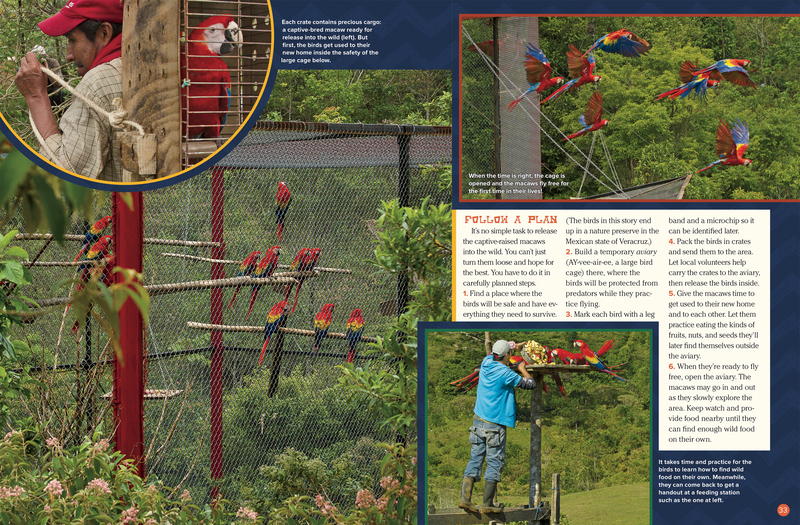 It’s no simple task to release the captive-raised macaws into the wild. You can’t just turn them loose and hope for the best. You have to do it in carefully planned steps. 2. Build a temporary aviary (AY-vee-air-ee, a large bird cage) there, where the birds will be protected from predators while they practice flying. 3. Mark each bird with a leg band and a microchip so it can be identified later. 4. Pack the birds in crates and send them to the area. Let local volunteers help carry the crates to the aviary, then release the birds inside. 5. Give the macaws time to get used to their new home and to each other. Let them practice eating the kinds of fruits, nuts, and seeds they’ll later find themselves outside the aviary. 6. When they’re ready to fly free, open the aviary. The macaws may go in and out as they slowly explore the area. Keep watch and provide food nearby until they can find enough wild food on their own. 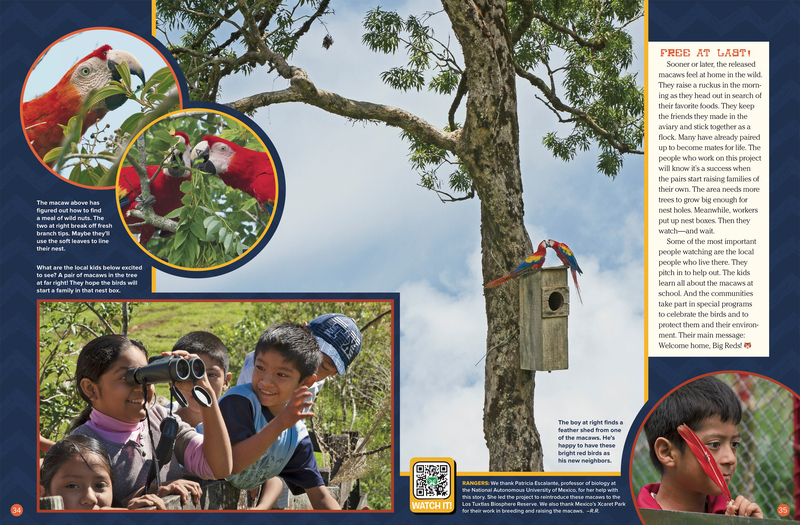 Sooner or later, the released macaws feel at home in the wild. They raise a ruckus in the morning as they head out in search of their favorite foods. They keep the friends they made in the aviary and stick together as a flock. Many have already paired up to become mates for life. The people who work on this project will know it’s a success when the pairs start raising families of their own. The area needs more trees to grow big enough for nest holes. Meanwhile, workers put up nest boxes. Then they watch—and wait. Some of the most important people watching are the local people who live there. They pitch in to help out. The kids learn all about the macaws at school. And the communities take part in special programs to celebrate the birds and to protect them and their environment. Their main message: Welcome home, Big Reds! “Welcome Back!” originally appeared in the February 2018 issue of Ranger Rick magazine.